devonfw constitutes a fundamental IT asset by offering high added value for Capgeminis custom software development practice. devonfw is the standard Java EE framework for developing solutions within Capgemini which allows for better productivity, quality reusing and customer satisfaction for our Java custom software development engagements. Agility: Boost development-speed, reduce cost, industrialize. Productivity: reusability, code-generation, automation and common problems already solved. Standardization: Build homogeneous solutions for your Java projects. Innovation: always evolving, keep the fast pace of technology and incorporate new trends that add value for the engagements. Security: Rest assured, devonfw follows best practices to secure your applications. Service oriented: Allows for SOA oriented solutions and eases integrations with other systems. Cloud-ready: Runs in your environments favorite App-Server as well as in the cloud. DevOps-ready: Supports development and operations with proven solutions for continuous integration, deployment and delivery. Control: Trace and monitoring of service and performance. Usability: provide a rich experience for the users (RIA) for web (multi-browser) and mobile (multi-device). Robustness: its components are battle tested and production ready. Environmental flexibility: Be free to use whatever tools and hardware you are required to use in your project – either open source or vendor-specific. devonfw imposes no constraints. devonfw has been used by companies and institutions across sectors: financial services, public administration, healthcare, automotive, utilities, education, retail… It allows for all sorts of business solutions as for instance in the field of electronic administration, public registers, route planning, risk management, after sales, time shift assignment, etc. Main references come from Germany and Spain projects where it has been pointed out as success stories on several events (like Spanish CITESAN and INFORSALUD in the healthcare sector). It also was presented by Capgemini Spain for the „The Computerworld honors program (2011)“. And more important, projects using devonfw have got the highest praise from the clients. devonfw also provides a working model. The experience in multiple projects has led us to a „mixed methodology“ between traditional and agile that allow us to to get the objectives of the agile model based on Scrum. devonfw has been developed on top of solid foundations combining the experience of our group from real and challenging engagements. It is already the standard CSD-framework on some of our business units (like for the Spanish and German market). It has been proven on critical projects with high availability requirements. It also has been acquired by several clients for further development of their own framework. Because of its modular design and layered architecture it is both flexible and scalable allowing to adapt to any environment, scale and solution. devonfw provides a standard working environment and accelerators to support a homogeneous team with highest quality and maximum productivity. Blueprints like the technical architecture documentation can be directly used to document the customer specific solution. devonfw offers alternatives for providing a very attractive and rich user interface for desktop, web and mobile. 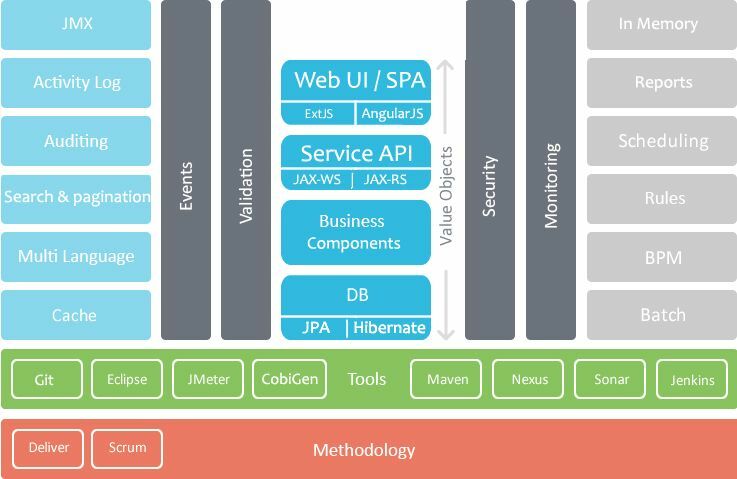 We currently offer solutions based on AngularJS (open source) and for the very powerful commercial Sencha libraries supporting all the major browsers and mobile platforms (iOS, Android). The framework allow to create Rich Internet Applications (RIA) with a broad set of powerful widgets as calendar, Gantt, scheduler, grids and charts, offering a unique solution for multi-channel enterprise apps. Applications built with devonfw are highly praised by the end-users because of the performance and usability of the user interface. Because it is oriented for general development, the framework is not tied to any platform or vendor. It is continuously evolving for getting the most of the base technology but keeping an eye on backward compatibility because not every customer is ready for the evolution race. The framework provides not only the technology but also the architecture guidance for the solution. It promotes best practices, patterns usage and pitfall avoidance leveraging the experience of the core team and the community around it. In short: devonfw solves the technology so the team can focus on the business functionality. devonfw is an accelerator for Custom Software Development (CSD) projects at Capgemini.